Welcome to Pembroke Fencing Club! Founded by Philip Lee in 2001, Pembroke Fencing Club was set up to provide hobbyists and competitive fencers alike the opportunity to learn, improve in and enjoy the historic sport of fencing. In 2007 the club engaged Olga Velma, right, an Estonian coach and fencing master with many years of experience and success. Olga specialises in developing the sport for school children and students. She has had many remarkable results both nationally and internationally. In 2011 she gained International FIE Epee/Foil coaching Diploma from Hungary, earning her the title of Maìtre Dàrmes. Her tuition gives fencers instruction and knowledge to fence intelligently and safely on the piste. Pembroke feels fortunate to have such a coach to assist our beginners, as well as our younger members. 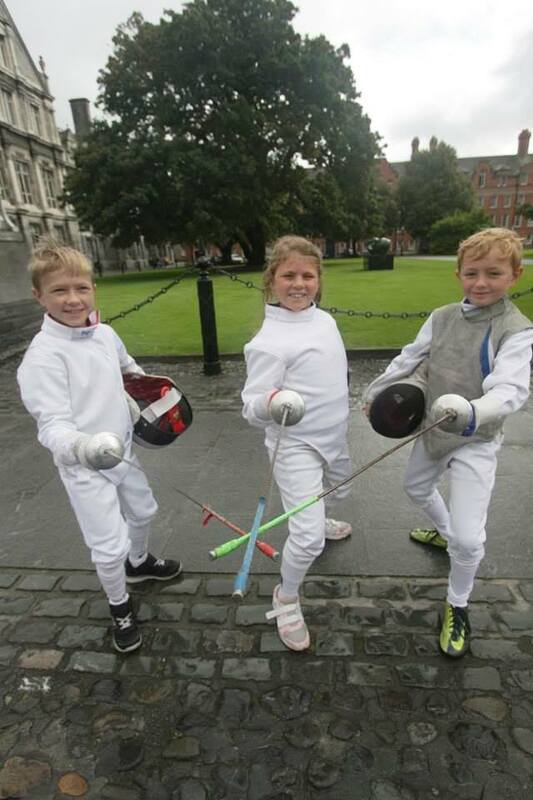 The Pembroke Juniors have played host to many achievements over the years, regularly competing in competitions both in Ireland, Nothern Ireland and abroad including the prestigious Marathon Foil tournament in Paris, Wratislawia Challenge in Poland and International Fencing Festival in Poznan, circuit U14 and cadets circuit. There is a warm and friendly atmosphere in the club and plenty of advice amongst fellow fencers. Fencing is very much a sport for men and women of all ages and abilities, and you don`t have to be incredibly fit to be a competent fencer. We welcome all ages and abilities and love you to join us as a member of Pembroke Fencing Club! We’re a very friendly community and we’re always delighted to see new faces. Drop in visitors from other clubs, cities, and countries are very welcome! Olga Velma has been involved in fencing for almost 30 years and has trained under several National Team and Olympic coaches. 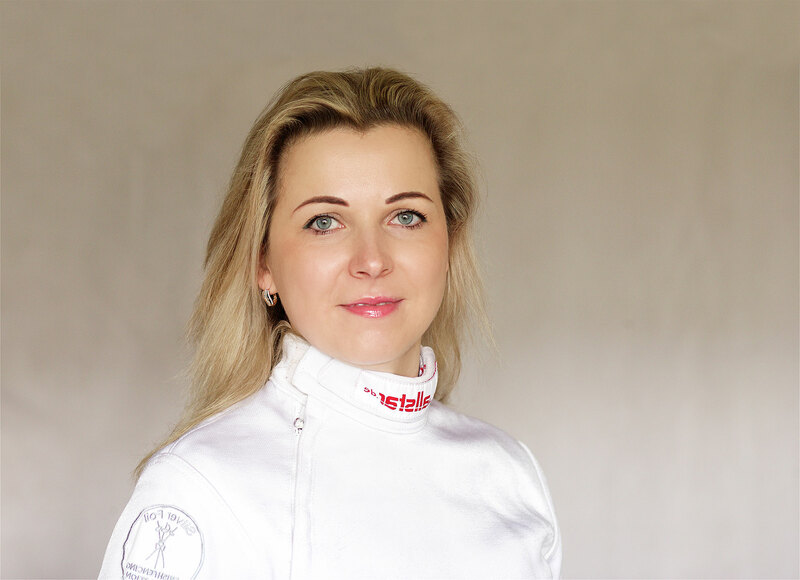 Olga specialises in developing the sport for school children and students and is a respected fencing master in Europe Personally she has had many remarkable results being repeated champion and medal winner of the Estonian Epee Championships in junior and senior fencing. She came second in the Junior’s World Cup in 1995 and was 5th at 1996 Cadet’s World Championships. 1998 Junior`s European Championships – Bronze in the team event, 1999 Junior`s World Championships – Bronze in the team event. Olga was a champion of Irish Open in 2008 and finalist of Irish Open in 2009. Also, Olga is a generous and splendid coach and working hard with young children. In 2011 she gained FIE coaching Diploma doing the FIE training course for the master of arms at épée and foil. David Losonczi is Fencing Epee Coach from Hungary. Started to work as a fencing coach in 2011 in Hungary. In 2016 moved to Dublin and started to work in Pembroke FC. The best international result is a Silver medal in 2005 at the Junior Team European Championship in Tapolca, Hungary; also one more Silver medal in 2006, Junior Team European Championship Poznan, Poland; in 2009 got a Bronze medal, Senior FIE Satelite, Belgrad, Serbia. David is still competitive fencer who is competing in Ireland and abroad. Recently David came 24th in Satellite Irish Open 2017. In national ranking he is on the top, number one in men`s epee. Joana Ramalho started fencing in 2000 at the age of 14. She started in a small club in Lisbon and after moving to the club of former Olympian Fencer Joao Gomes. Joana was part of the Junior and Senior Portuguese National Team until she left the country in 2007. After a break, Joana returned to fencing when she arrived in Ireland in 2010. 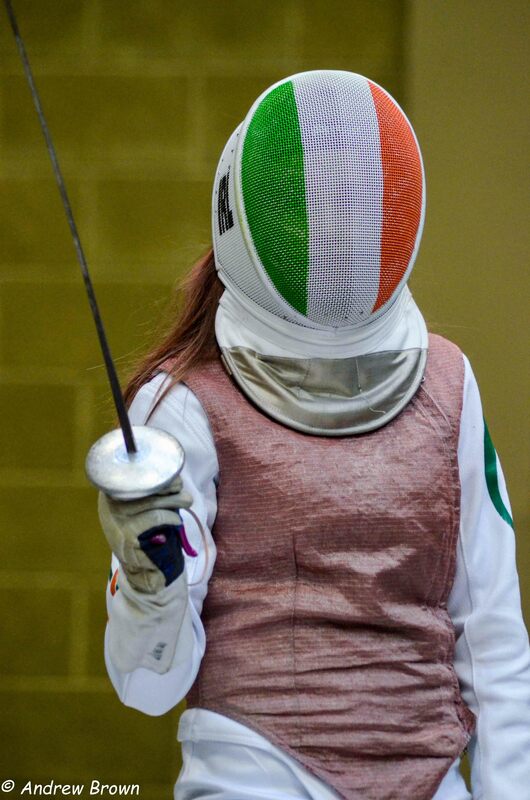 Since then she has been one of the top-ranked fencers in Ireland. 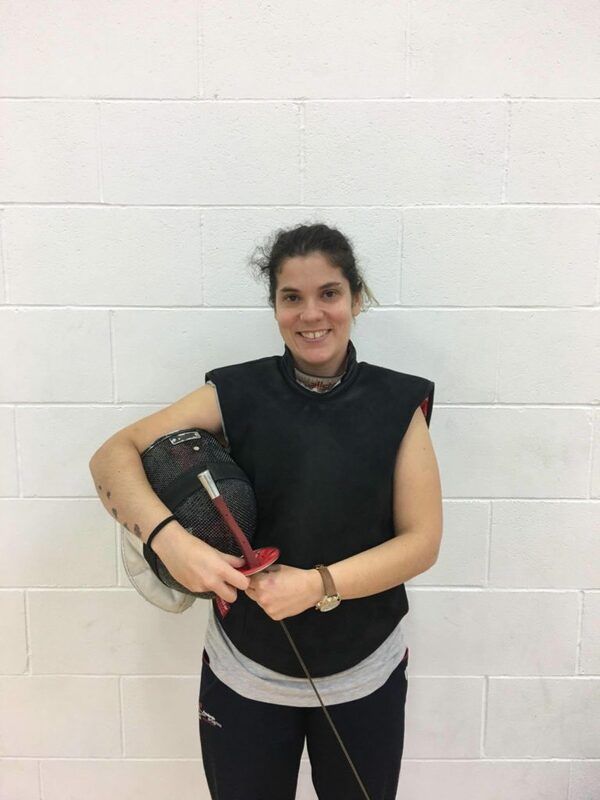 Joana joined Pembroke coaching team 4 years ago and has done a number of workshops ever since with different coaches to improve her skills and help improve the fencers of the club. Our mission is to educate the community about the modern Olympic Sport of Fencing. We also endeavor to train individuals of all ages to succeed in the sport. Pembroke Fencing Club coaches are professionally trained are committed to supporting fencers as they work to achieve their individual competitive and athletic goals. We do this by fostering the principles of respect, patience, and a competitive spirit. SPORTSMANSHIP: To provide a friendly and supportive club. 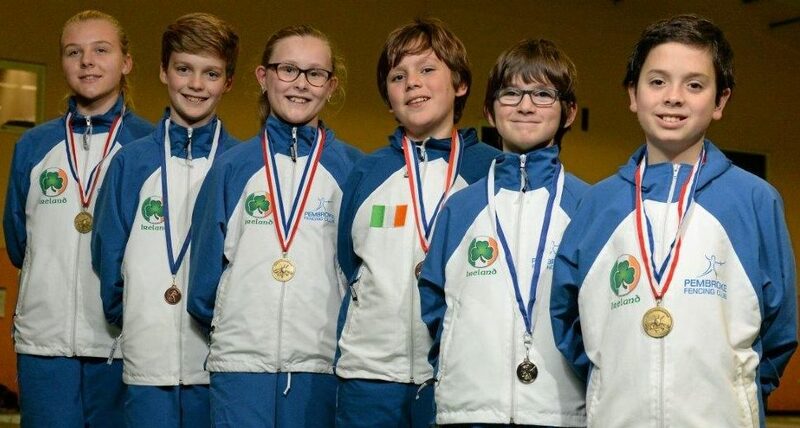 EDUCATION: To provide coaching and training that meets the highest standards of excellence and follows the precepts of Fencing Ireland and to foster the development of fencers as people, athletes, and competitors. COMMUNITY: To develop and maintain an enthusiastically satisfied community at all times. Pembroke Fencing Club is fully committed to safeguarding and promoting the well-being of all its members. The club believes that it is important that members, coaches, administrators and parents associated with the club should, at all times, show respect and understanding for the safety and welfare of others. Therefore, members are encouraged to be open at all times and to share any concerns or complaints that they may have about any aspect of the club with Any Club Official. Sports clubs for young people should offer a positive experience where they can learn new things in a safe and positive environment. In order to ensure a safe, productive and sportsmanlike atmosphere for all our members, everyone entering our facility must adhere to our Code of Conduct and is expected to hold one another to these standards. By using our facility, fencers, their families and guests, agree to abide by the Code of Conduct / Rules and Regulations and be subject to its disciplinary provisions. Members, families, and guests are expected to show respect for our fencers, coaches, visitors, staff, facility and the rules of the sport. Abide by the precepts of integrity, good sportsmanship, and respect while fencing and in your daily life. Demonstrate respect and good sportsmanship with both words and actions. Everyone who participates in Pembroke Fencing Club activities has the right to feel safe, included, valued, and accepted. Members, families, and guests are to respect the Club facility, Club property, and fencer personal property. All fencers are expected to be generous, flexible, honest and of goodwill with one another. Lose with honour and win with dignity. Less experienced fencers should ask more experienced fencers to bout. Experienced fencers should fence with less experienced fencers with patience and encouragement. When entering the Salle, the fencer must greet your coaches and fellow members. When leaving, give your regards to your coaches and fellow members as well. Fencers utilizing the Club’s equipment are required to ensure it remains clean and in working condition. All Club equipment must remain on the premises. Fencers must return their fencing equipment and apparel to their appropriate storage areas in an orderly fashion after each use. Be respectful while fencing. At the end of a bout, shake your opponent’s hand with your non-weapon hand. Never argue with a referee, opponent, instructor, or coach. 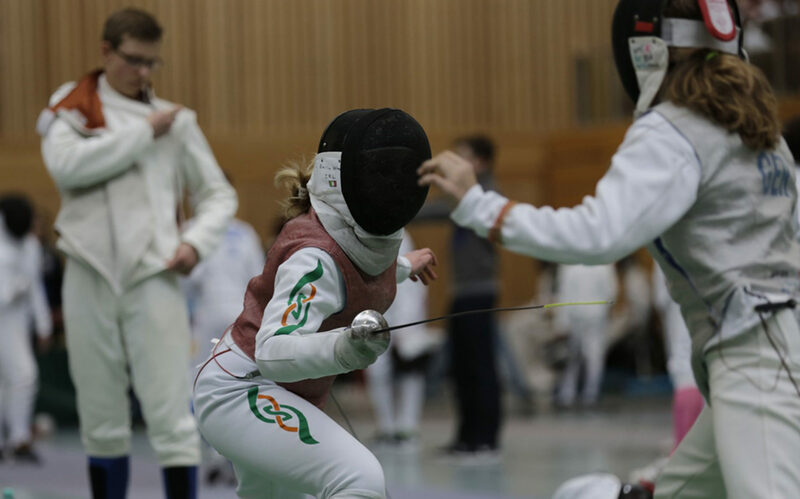 Fencers, their families, and guests who continue to violate these guidelines after being told to stop may be required to cease fencing for the evening. Severe unsportsmanlike behaviour listed below will result in immediate suspension from the Club. You will be required to leave the facility immediately. You will be prohibited from using the facility until the Board of Directors reviews the actions of the fencer. The fencer may appeal the suspension to the Board of Directors. The Board’s decisions are final. FENCING MEMBERSHIP: Non-members may take eight (8) introductory lessons. Once the introductory lessons are completed, a non-member must complete a Member Agreement and purchase their own personal equipment (mask, jacket, lamé and mask cord (Foil), 2 body cords, 2 weapons, knickers, and plastron) within a month. Exceptions are the intermediate course for seniors and fencing classes for children U14. PAYMENT: All Members must pay the Club dues. Club dues are required regardless of attendance as per Any member delinquent greater than thirty days (30) may not participate in fencing activities until the outstanding dues are brought current. SIGN IN: Non-member fencers must pay the Guest floor fee 15 euro. ATTIRE: Proper attire is required for participants using the Club. Fencing knickers are required during all practices. Introductory fencers may wear long athletic pants until they become members. Shirts and shoes are required in all public and recreational areas. Athletic or fencing shoes are required. EQUIPMENT CLUB: Introductory fencers have use of any Club equipment including weapon, mask, cord, jacket, lamé, glove, and plastron as available for their eight (8) lessons. One (1) month after the Introductory fencer has signed the Club Membership Agreement, the fencer is required to have obtained personal equipment (Mask, 2 weapons, 2 body cords, jacket, lamé & mask cord (foil), glove, chest protector, plastron, knickers). Otherwise, a Rental Fee will be added to the membership fees. All fencers who use the Club equipment are responsible for repair or replacement of any damage or loss of equipment while it is in their possession. PERSONAL: All Members are required to supply their own equipment within one (1) month of becoming a Club member. CHANGING ROOMS: All Members are expected to keep their changing room area neat and clean. The Club is not responsible for personal property of Members or guests. DAMAGES: The cost to repair damage to the Club’s facility or equipment by a Member, their family or Member’s Guest shall be paid by the Member or parent/legal guardian if under 18. Children under the age of sixteen (16) must be accompanied and supervised by an adult (age 18 or older) at all times while at the Club. FACILITY RESTRICTIONS: Restricted areas for families, guests and children is STORAGE AREA. KITCHEN: The Club kitchen is available for Members and Guests. When available, food, drink, utensils, and cups, are based on an honor system. Please donate appropriately if any food or disposable items are taken. Kitchen items must be cleaned and returned to their original location after each use. GENERAL: All Members shall be required to comply with and abide by any and all rules and regulations governing the Club. Members who violate such Rules and Regulations shall be subject to the termination of his/her membership. FACILITY CLOSING: The Club staff reserves the right to close the facility from time to time for private functions, holidays and/or emergencies. PRE-REGISTRATION for fencing classes and programs is highly recommended. Space is limited to insure a positive athletic experience. TO REGISTER for a fencing class or program or to become a member of Pembroke Fencing Club please register by email or print out the form and bring it on the day and hand to fencing coach. We accept Cash and Cheques. NO REFUNDS will be given for any reason including no-show, illness, prior obligation or for cancellations made less than seven (7) days in advance of the start of any program. NO TRANSFERS to future programs or dates will be accommodated after the first day of any class or program. Transfers due to injury will be considered on a case-by-case basis. If you are unable to attend last minute you are welcome to send someone in your place. Please contact Pembroke Fencing Club in writing or by email with your replacement’s name, address, phone number, and email address. PFC Membership is a twelve (12) month, non-refundable commitments. If PFC cancels a fencing class or program for any reason, you will have the option of transferring to another section of the same program or to receive a full refund of all program fees. PFC fees are non-refundable. PFC fencing programs are for student’s age 6 and older. Children, when accompanied by an adult may observe at any time. Children under the age of 6 are not permitted on the fencing floor. USE OF IMAGES, NAME IDENTIFICATION: I authorise Pembroke Fencing Club to use images of me and/or my child with and/or without identification for Pembroke Fencing Club publicity, promotional and advertising and release any and all claims and/or rights I and/or my child might have as a result. I agree to indemnify and hold harmless, and hereby release, Pembroke Fencing Club and its managers, coaches, instructors, members, guests and other participants, and the Fencing Ireland from all claims, liability, demands, or actions of any kind in connection with my participation in any training session, program, tournament, or other activity that I may attend at Pembroke Fencing Club, or any other athletic or training activities sponsored by Pembroke Fencing Club on or off the club premises. This includes, but is not limited to, claims, liability, demands, or actions for personal injury or property, damage or loss. This agreement shall be binding on my personal representatives, heirs and assigns. ASSUMPTION OF RISK: I understand that athletic activity involves physical exertion and risk of injury and that the sport of fencing involves aggressive physical contact with other participants. I assume the risk of injury or other medical conditions arising as the result of my participation in any athletic activity in which I engage at Pembroke Fencing Club. I understand that it is my responsibility to wear appropriate clothing to all training sessions. I understand that I am responsible for my own safety and for conducting myself in a safe manner at all times. Pembroke FC has chosen to adopt Fencing Ireland’s policy in its entirety.